Stockholm 2015: this chair by Swedish-French design duo Fredick Färg and Emma Marga Blanche features a metal frame that mimics the shape of trouser braces. 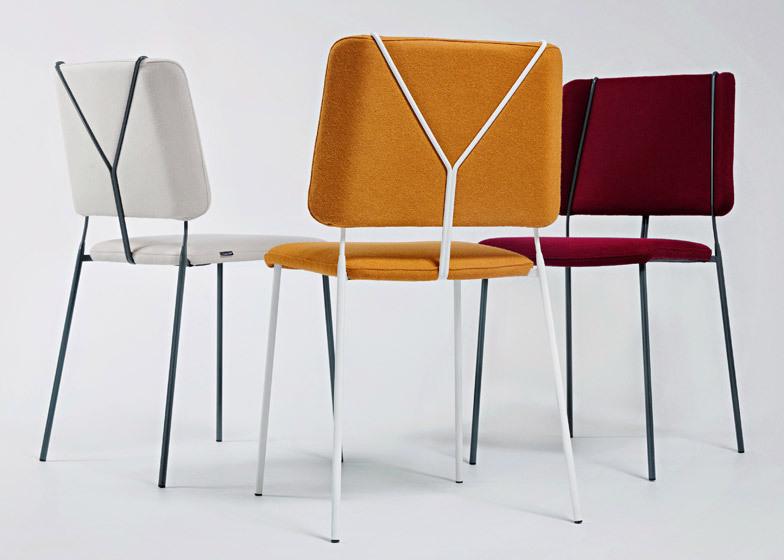 Named after American Lindy Hop dance legend Frankie Manning, Färg & Blanche's metal-framed stackable chair for Swedish furniture manufacturer Johanson is designed for office and commercial environments with an upholstered seat and sprung back. The frame at the back of the chair mimics trouser braces, a nod to the fashion during the Lindy Hop and swing dance era from the 1920s to 1940s. "I am fascinated by both fashion and dance," said Färg – a proficient Lindy Hop dancer himself. "In the case of Frankie, we thought it would be exciting to let such a pronounced detail as trouser braces hold up and form the whole of the seat back." The chair is available in a choice of 500 fabrics and 192 colours. "The metal frame can be enamelled in contrasting colours to accentuate the feeling of the straps," said Blanche. "It can also be quite elegant in a more neutral colour." The back is often the part of the chair most visible in commercial spaces. "Fredick and Emma Marga have emphasised the back of the chair and this gives the whole piece a creative and exciting graphic expression," said a statement from Johanson. Frankie was launched at this week's Stockholm Furniture Fair, which concludes today. Other chairs that debuted at the event include Note Design Studio's lounge chair sized for compact spaces and Luca Nichetto's seating range intended to merge Italian and Danish design. Last year, Färg & Blanche presented furniture created by sewing pieces of plywood together and a small padded chair during the annual Stockholm Design Week.